Merit Software was a Texas-based publisher that was active from 1989 to 1996. In 1994 it changed its name to Merit Studios and opened a branch in Europe. The European location not only published games though, it also developed a few with the best known game being the Super NES port of Codemasters' Micro Machines. Founded in 1924, Metro-Goldwyn-Mayer, or MGM, is best known for its production and distribution of films and television shows. In 1994 it entered the video game industry with the founding of MGM Interactive, a division that primarily distributed games and worked with game publishers to leverage its properties. The MGM Interactive logo may also appear on the packaging of games based on Orion properties as MGM acquired Orion Pictures and its game division Orion Interactive in 1997. MGM dropped the "Interactive" branding in 2007. Microillusions was founded in the late '80s by Jim Steinert and published computer games, as well as multimedia software for the Amiga, from 1987-1989. 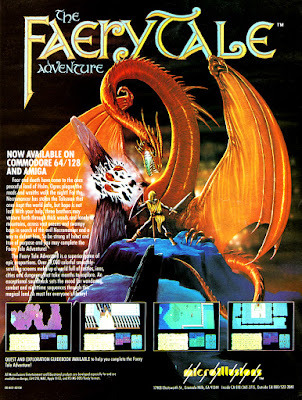 It's most popular game was likely The Faery Tale Adventure which was programmed by David Joiner who did contract work for the company. That game was also released on the Sega Genesis by Electronic Arts.